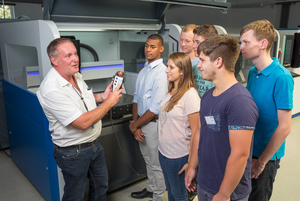 Mühltal, August 11th 2015 – Last week, DATRON AG welcomed six new apprentices. Matthias Hix, Christian Lenz, Martin Niehof and Niklas Dörhöfer will be trained as mechatronics technicians, while Jerome Elser and Christina Sawal have decided to pursue a career in business management. Franz Gruber, DATRON supervisor for apprentice technicians, explains: “We want to encourage our trainees to act on their own initiative. 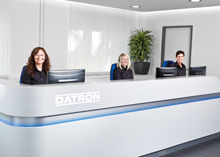 We provide them with much freedom to do so – and it works.” The ultimate goal are all-around well trained graduates who understand machine building companies like DATRON as a whole and who are capable of assuming various positions in them. “Our mechatronics technicians for example know the machines as well as their sales and production processes – so they can later build a career in either our production, buying, sales, technology center, development or service department”, says Gruber. The most important part is individually coaching every apprentice: “Everybody’s training is different, because every trainee has different strengths and interests. At DATRON, our experienced employees support the apprentices not only in becoming proficient in their field, but also in learning how to work highly autonomous. In the end, we all profit from this”, he adds.